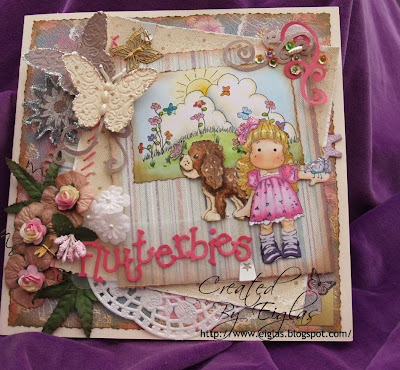 Good Evening and welcome back for another challenge at Crafty Cardmakers! Firstly thank you for your fantastic one layer card entries, they really are amazing! Our next challenge for you is by Gill and she would like to see BUTTERFLIES somewhere on your creation! Crafty Cardmakers is going on holidays over summer so we'll be back on Monday 5th September with our winners and new challenge! We're sponsored by The Stampman for this challenge and you could win a £10 voucher to spend in their store and it is jam packed with tons of crafty goodlies to suit all tastes. They also have their own fantastic range of stamps so please do go check them out. these two cards i have made with my new set of spellbinders the backing paper on the first card is from craftworks with a light embossing on it. 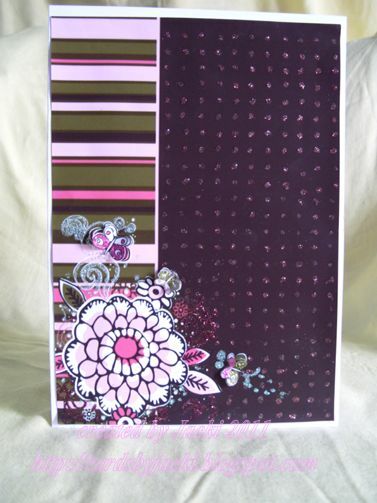 edges cut with MS punch mat sentiment tag and flowers and butterfly cut with spellbinders. i inked them with sir tims distress inks while still in the die it's quite effective. The butterfly is a digi from Delicious Doodles which I've printed and coloured with Sakura Stardust pens. I made the paper to match using Photoshop Elements. 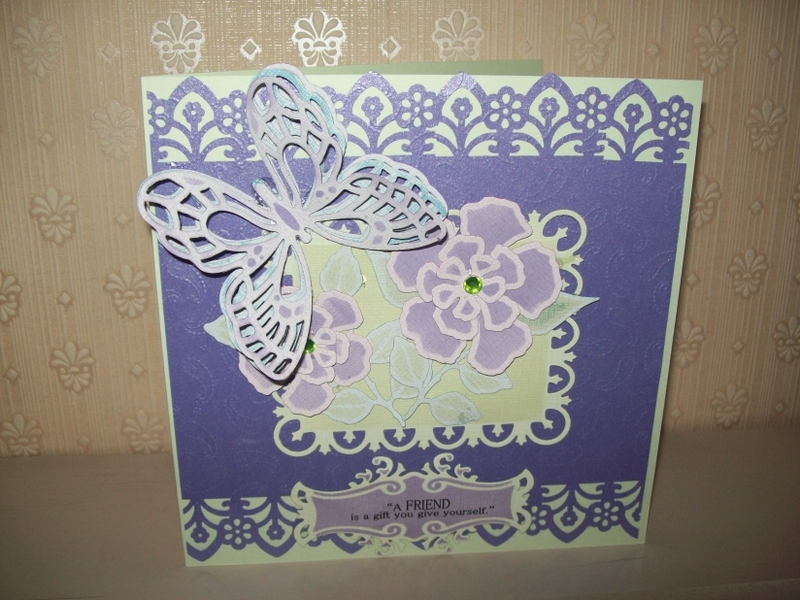 The border punch is Martha Stewart, the flower is from Prima and the gem is from Poundland and coloured with Promarker. The flower was coloured using Twinkling H2Os. 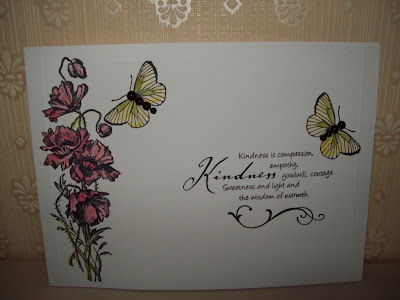 The butterfly and bird acetates are by K&Company, sentiment is a preprinted one by Anna Griffin. The background paper is from an 8"sq. pad, but I'm now not sure which company. 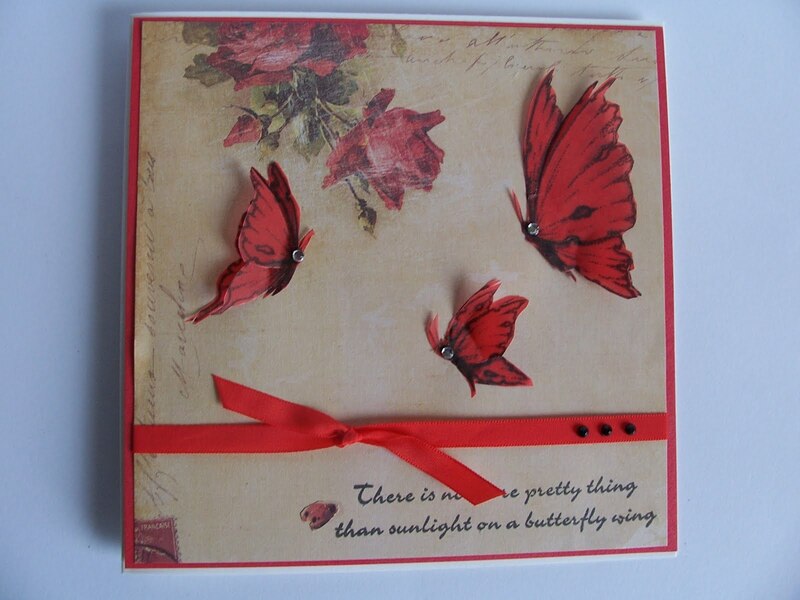 I stamped the butterflies, onto red vellum, each twice, the first one being stuck to the main card, the second of each are only stuck at the body section, so they appear to be in a flying position. 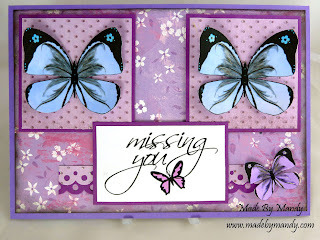 The Tattered Butterflies stamps are from Personal Impressions designed by Lyndsay Mason. 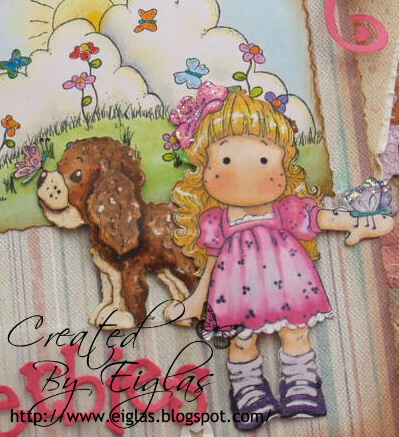 I have paper pieced her dress from dotty paper and coloured the rest of the image with ProMarkers. All of the papers are from the Prima Jack and Jill collection. 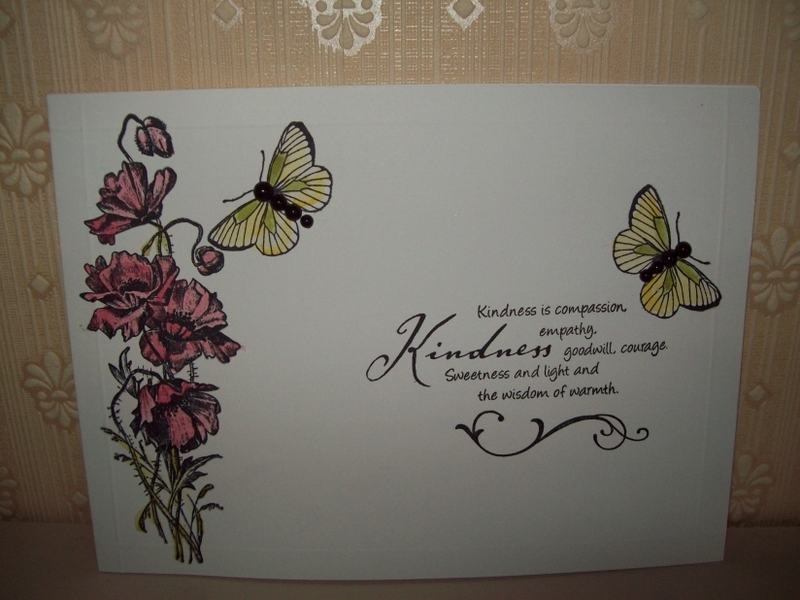 I used my martha garden trellis punch and a craftwork cards sentiment, and finished off with some butterly peel offs (one coloured in with sakura pens) and some stickles. I've chosen Tilda this week to assist with my butterflies! Both she and her dog have one and there are several fluttering in the meadow behind them! In case that wasn't enough, there are two die-cut butterflies crusted with stickles top left and a goldtone charm. My lovely fabric-look papers were from C&C, believe it or not, one of their rare bargains. You can't see much of the base paper, which is a shame because it's quite lovely, with fairies, butterflies and pink bindweed on a textured ground. I coloured Tilda, her dog and the meadow in a mix of Copics, Marvy-le-Plume and Stickles! As this my choice of theme I decided to go with something I LOVE! So BUTTERFLIES it was! I decided to try my hand at a wee stepped card and wanted to use my new Magnolia Butterfly coloured with Promarkers! The Papers are Bo Bunny, inked at the edges with distress ink. 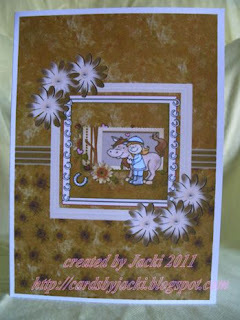 I used my nesties for the wee centre frame, added flowers from Wild Orchid and lots of giller to finish! I started with a piece of blank white card and ink dusted some Big N Juicy ink across it. I then stamped the gorgeous large (almost 6") butterfly from EI in versamark ink and embossed it with Sheena WOW sparkly powder. The BP is from EI from the Graphicus Guild welcome pack. The lace I dyed to match and the flower was from my stash. The little purple bits are various Marianne diecuts and the sentiments is also from EI from the same sheet the butterfly came from. 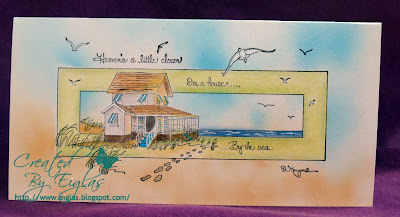 I have created this card with a resist technique using adirondack inks and a brayer and a butterfly stamp I picked up a while ago. I am not sure what the other stamps are either as I borrowed them at the craft day I went to. The butterfly is made using the same colours in alcohol inks, stamped onto card and cut out to give a 3D effect. 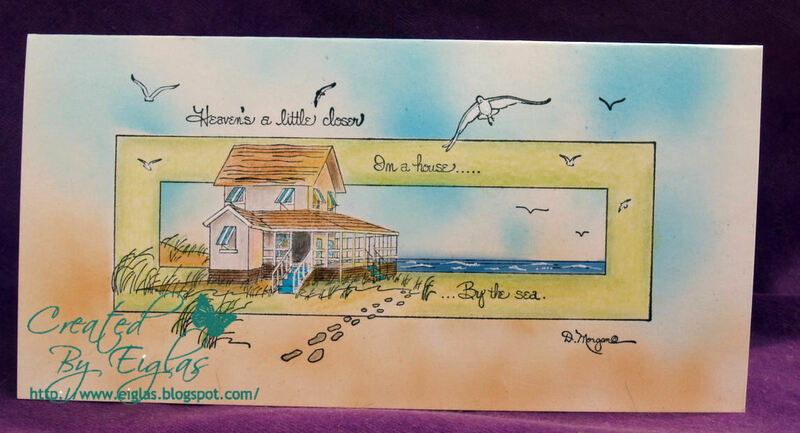 My card has been made using digi's from McMahon Five Designs coloured with Promarkers. Main background paper is from DCWV and the glitter embossed spotty paper is from My Mind's Eye. Scraps of paper and cardstock have been punched with an MS punch and all mats are raised with 3d foam. The wings have been gently curled and a little Sakura glitter has been added. I cut a frame using a go kreate die, then used this as a mask to sponge distress inks through, using 'broken china', 'faded jeans' and 'black soot' inks. The butterfly and dragonfly stamps are from the Penny Black 'salutations' set and the sentiment is Stampin' Up. Added a pale blue pearl to the butterfly. 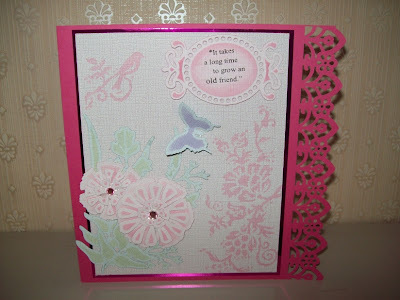 Evening All and welcome back for another challenge at Crafty Cardmakers! Thank You sooo much for your fantastic entries to our Spots & Stripes challenge, a popular choice (one of my favs too!) We had some fantastic entries and glad you enjoyed as much as us! We are sponsored today by ONE STOP CARD CRAFTS who are offering a £10 voucher for their store as a prize. Over to the team and they're inspiring creations - Note some were as terrified as you so havent they done well! One layer cards used to terrify me, but I've made quite a few now and quite enjoy the challenge! I've dabbed distress inks (Broken China, Shabby Shutters & Faded Jeans) directly onto an acrylic block, sprayed the block with water and then used it as a background stamp. Dried this with a heat gun, then added a Flourishes stamp using memento 'paris dusk' ink, the sentiment is from the same set and was also stamped in 'paris dusk'. Cardstock is white linen from Papermill Direct. I also lightly sprayed over the stamped area with iridescent 'spray & sparkle' but it's not showing up in the photo. 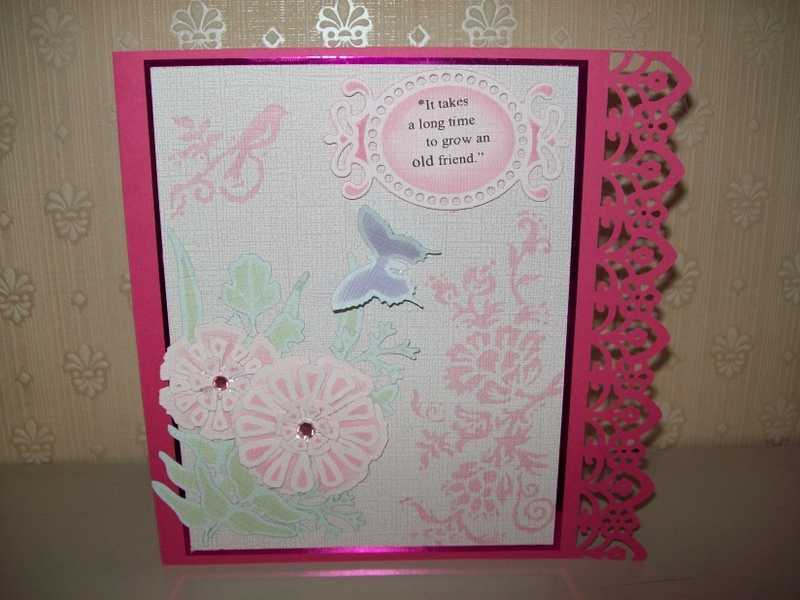 i think this is first time i have made a one layer card as i am a bit of busy card maker. i chose to make my card in landscape for a change and felt it suited the layout better. 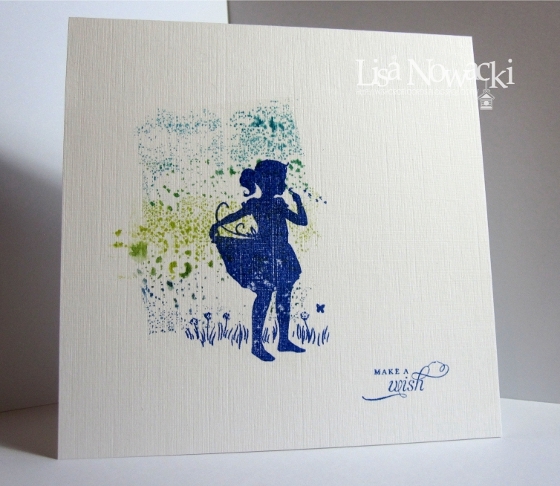 the poppy stamp is a foam stamp from la pashe coloured with prmarkers. the wording is from a set i have had for years can't remember who they were made by. 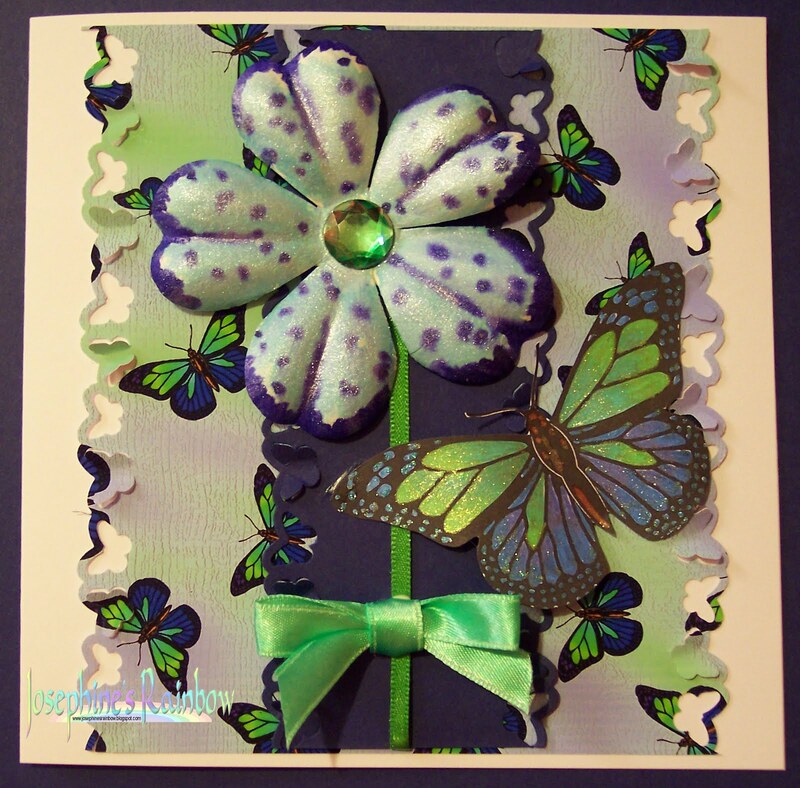 butterflies are from one of my flower fairy sets. hope you like it. i have drawn an embossed line all the way around the card edge but it doesn't show very well on photo. 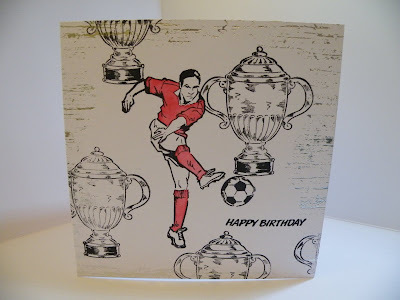 This is the first time I have ever shown a one layer card I have made as I find this style really difficult, I also want to add things, I would normally have decoupages the footballer and the ball but I resisted this time. This was for one of the men in the family who supports a team who wear red I used some ink to watercolour the red sections. 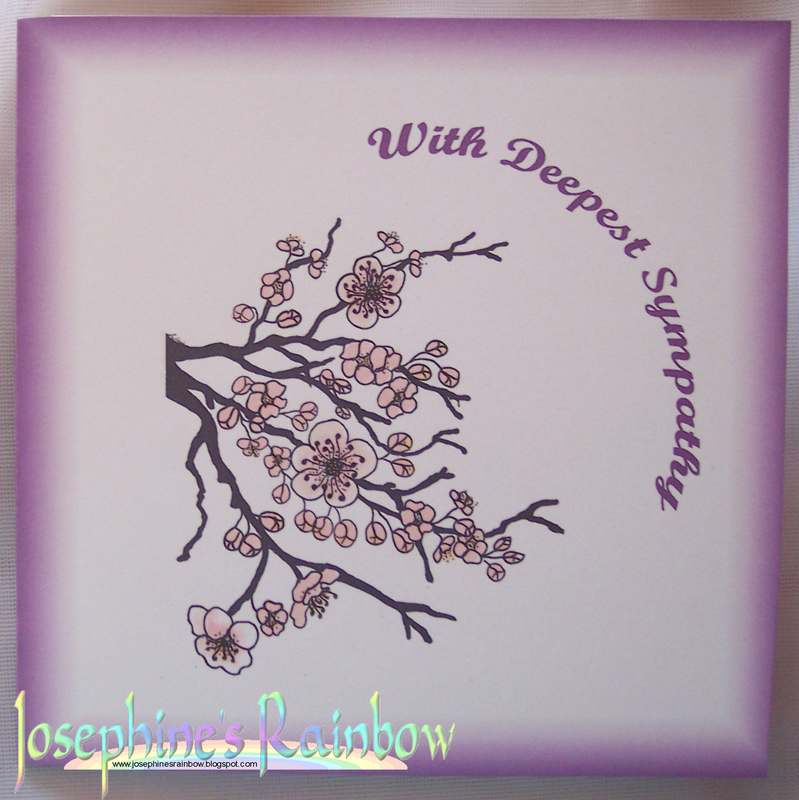 A single layer card is likely to be a fairly simple design, so I decided to make a sympathy card. 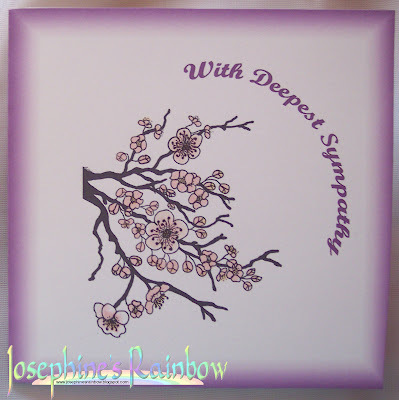 The image is from The Creative Mind of Sylvie and it was a freebie from her a while ago. I changed the image colour from black to a dark grey to soften the effect, then framed it with a feathered gradient border and added the sentiment. I then printed the result and coloured the flowers with Promarkers. The main image is by Paperbag Studios, the script and word 'Beautiful' is by 7Gypsies. Wow....I found this challenge exactly that!! A real challenge, quite scary lol. 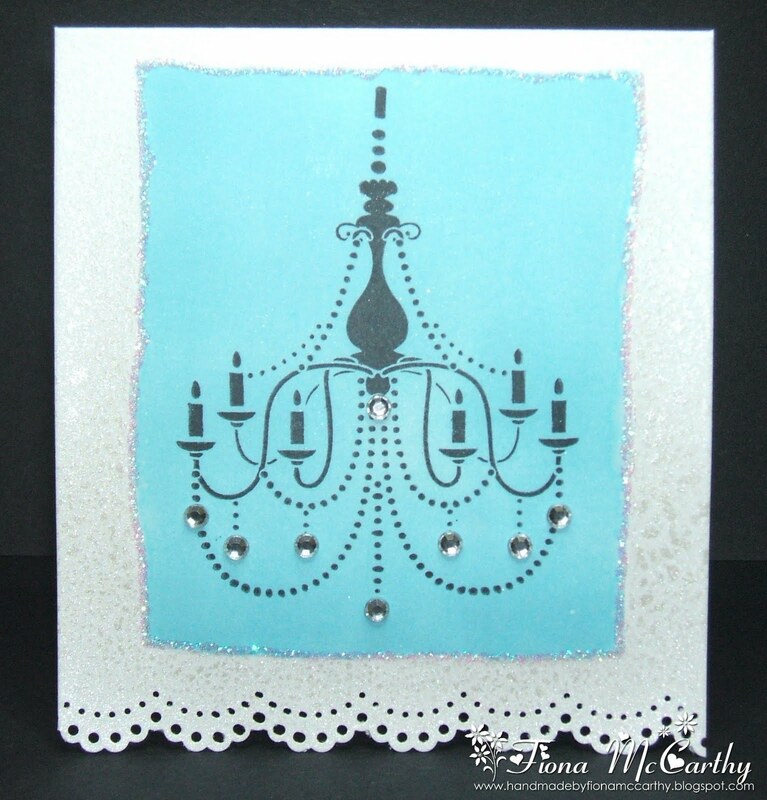 For my one layer card I started by punching the bottom of a white card with my MS Lace punch. I then ripped 2 long pieces of masking tape in half. I placed the masking tape down in the rough shape of a square and inked the square with my tim holtz ink. Then I used my Kanban stamp in the middle of the square. 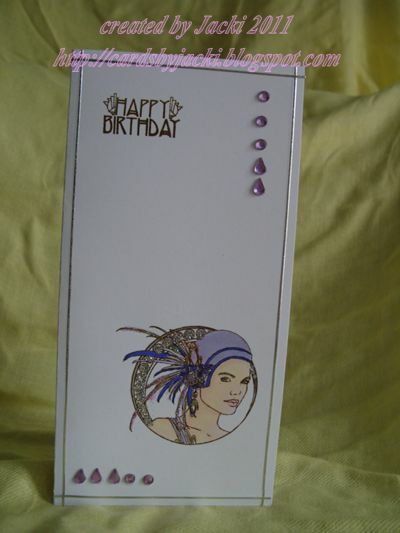 I made a mat of paper to cover the square and the sprayed over the whole card with pearl shimmer spray. Then to finish it off I added gems to the image and made a border around the square with stickles. I found this quite challenging too - I've only made about six single-layer cards ever! now-defunct, 'Stamps Happen' rubber stamp company. The nature of the one layer card is that I couldn't use my normal Copics-friendly card as it's too light to stand unaided as a card and the uncoated stock card does not like markers - they bleed all over the place - so I masked and airbrushed the background, sky and sea and used my Lyra pencils and Sansodor for the house and the green border. For this wee challenge I stuck with a simple cream care and image! I coloured the Tatty Button Toadstool Retreat stamped image with my promarkers, added a wee ribbon some gems and a sentiment! Simple but really striking if I do say so myself! Not the best pic in the world, sorry. I cut a rectangle in a sheet of paper and used it to mask a scalloped edged card which I then inkdusted with Big N Juicy. Then I stamped the Kanban image onto it and embossed it. I bleached out the woman and flowers and finally coloured them in with Cosmic Shimmer paints. The sentiment was added by putting it through the printer after I finished, a scarey moment! In future if I wanted to do that I would print first and design second, or use safmat. Although this is not my usual card style, I really enjoyed it. I inked the edges with Spun Sugar and Dusty Concord. I then stamped a Kanban image in the left hand corner and over stamped a LOTV sentiment. I just could'nt resist adding a couple of tiny black gems in the top right hand corner. This is something I will definately be trying again. I'll post Sarah's winners as soon as I get them! Well Done all, please grab your badges above and winners email me your deets!